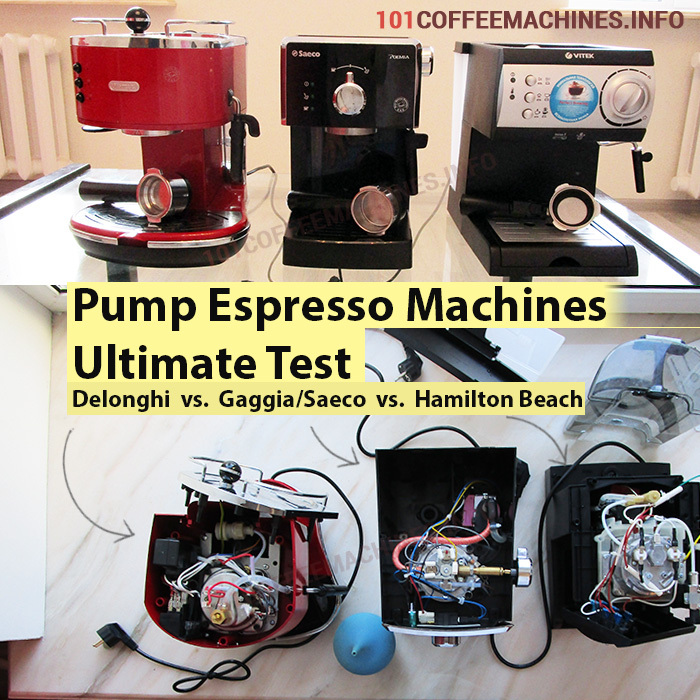 Pump Espresso Machines Ultimate Test: DeLonghi vs. Saeco/Philips/Gaggia vs. Hamilton Beach/Clatronic. Compared and Disassembled. NB! That article is NOT about: single serve coffee makers, steam and super-automatic machines. 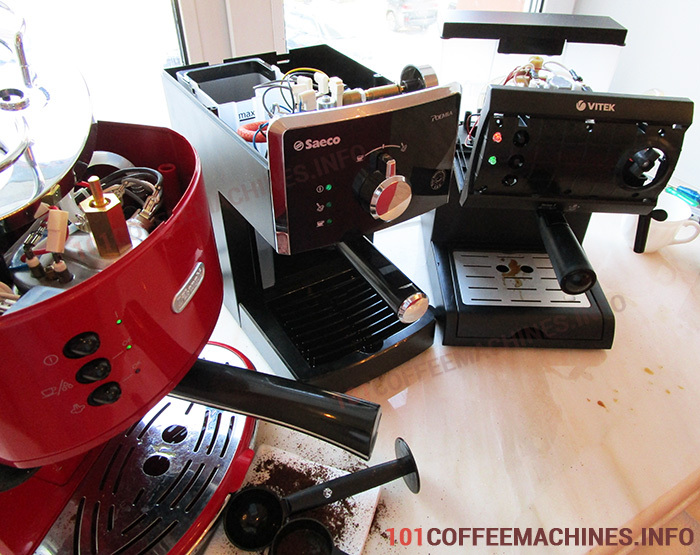 Read here to compare super-automatic espresso machines by Delonghi and Saeco. 15-bar pump is needed to make the real espresso shot. With lower pressure (with no pump as in steam espresso makers) the machine will not be able to push hot water through tampered coffee. Boiler compared to the thermoblock will give you more stable temperature of water. However, it can deliver limited amount of water with ideal temperature. After that limit the temperature will fall and coffee will be underextracted. Having these three things in mind and being short on budget you will find variery of models in the shop. De’Longhi ECO310BK or EC155, Capresso EC50 or EC100, Saeco HD8325/47 Poemia Class or Gaggia Gran, Hamilton Beach 40715… They all qualify for above-mentioned criterias, however prices significantly vary. Delonghi’s makers. They all are the same under the hood except Delonghi EC 145 that stands alone because of unpressurized filter basket and except Delonghi EC680/820/850. Last three models have thermoblock inside, not boiler. All other pump espresso machines from Delonghi are for 95% equal inside: identical boiler, indentical pump, identical or very similiar panarello, holders, filters. It means, that EC155, EC330, ECO310, ECO311, ECP3220, Ec 250 and other models will be diffrent only in matters of design and minor details. General functionality is the same in all cases. All Kenwood espresso makers are also based on Delonghi’s parts. Saeco, Philips and Gaggia models. Both Gaggia and Saeco now belong to Philips. That’s why Philips Saeco Poemia (HD8323, HD8325, HD8327, HD8425), Gaggia Gran Style/Deluxe and Saeco RI8329 make identical espresso. Hundreds of OEM-manufactured chineese models, that are sold under local brands all over the world. Clatronic in Europe, Vitek in Eastern Europe and India, Hamilton Beach in U. S., Somela in South America. All of them are based on the same model, that is designed in China, where factories produce hundreds of clones with different labels and slight outlook changes for global market. Again, most of them are identical under the hood. That lead us to the conclusion, that we need to test and compare only three particular models one from each category to understand the difference between majority pump coffee maker models. And that’s what I did. I bought Delonghi ECO311 Red, Saeco Poemia HD8323 and Vitek VT-1511 ( = Clatronic ES 3584 = Hamilton Beach 40715 = Somela Capresso New! I published a simplified separate review of these machine: HB 40715 reviw). Having those three coffee makers in my hands, I will be able to make The Ultimate Test. Not only compare official product informations. I will also disassemble it to make measurements of boilers volumes, temperature settings, timings, durability and material quality. And even make blind tests of espresso taste and crema, as well as compare ease of milk frothing for cappuccino and usability. Let’s start? Chineese water reservoir that installed on HB 40715/Clatronic 3584 has the plastic smell. Even after several weeks of using it still has the smell. I can’t exactly say that I can smell it in the cup – primary because the coffee itself has much more stronger smell. However the whole machine is smelly and the water tank is epicenter of that smell. Delonghi’s and Saeco’s tank have no extrinsic odor out of the box. The ergonomics of Saeco Poemia’s tank could be better – the water tank is installed inside the machine and the only small window is left for user to check if it still ebought water. HB 40715 has now look-up window, but the water tank itself is externally installed. So you can check the level visually. the plastic walls of water reservoir are not transperent enought, however it still possible. Delonghi ECO 311 has the best ergonomics, the tank is 100% trasperent and you can look at level of water from all point of views, even from front. In that round, I give 5 out 5 points to Delonghi. Three points to Saeco and two to HB 40715. When it comes to boilers, we have first secret to unveal – the boiler material and boiler sizes are unknown. Let’s unscrew the coffee makers and look inside. Delonghi (on the left) and Clatronic 3584 (on the right) have relativly the same boiler sizes. However, the one from Delonghi is made of stainless steel, while chinese one is made of aluminium. The main suprise to me was new Saeco’s boiler (in the middle). I knew, that they changed the boiler material – in official specification on Saeco’s websites new models are said to be equipped with aluminium boiler. Not stainless steel as it was before. But they changed not only the material. The heating element is now external, it curves around the boiler body and heats it. That allowed Saeco to make boiler smaller. Also it reduces the scale inside the boiler – that definetly is good. On the other hand, such design reduce thermostability, the water is not equally warm inside the boiler with external heating element. By the way, the quality of tubes for water looks indentical in all three machines, except the fact that Poemia’s tube from pump to boiler is covered by thermo insulation. Electric wires are different. 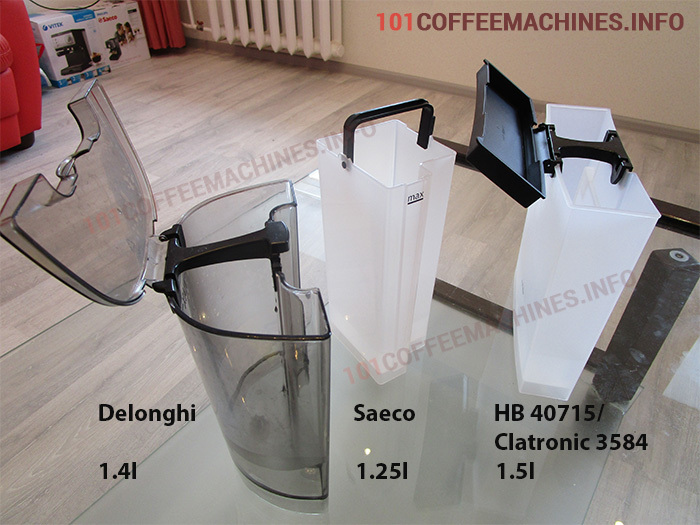 Electric wire diameter is smallest on HB 40715/Clatronic 3584, than comes Saeco Poemia and Delonghi has the biggest cross-sectional area of a wire. But let’s go back to boiler. I still need to find out the way to measure boiler’s capacities of Delonghi, Saeco and Hamilton Beach. I decided to use enema for it. Sounds too comlicated, but it’s the easiest method I can imagine to measure boiler volume. Does sizes and material influence the taste and aroma of espresso? I will find out it further, when I will run several blind tests. I will not give marks for this round yet until the taste and aroma test. When it comes to espresso people usually pay attention to its flavor and crema. Espresso crema is special foam on the top of espresso shot that could indireclty indicates the quality of the drink. If we are talking about cappuccino the outlook of milk froth is such an indicator. Let’s test which espresso machine produce best crema and best foam. Important notice about crema. On professional coffee machines crema is the indicator of good taste. Crema will apear only if the coffee beans are fresh, grind settings are correct and if the barista tampered it good, forming a steady coffee tablet. If everything is made ideal, only water flow under 6-8 bar pressure will be able to press it. On home use espresso machines so called ‘pressurized portafilters’ are used. They are designed to create fake crema and they are less demanding to grind level and tamparing. It means that even with old beans grounded on cheap coffee grinder and without right tamparing you will get decent cup of espresso. With great crema on it. But in that case the crema is fake, it is not an indicator of the taste anymore. It just looks good. The last photo shows that Delonghi could make good crema if you tamper coffee properly. But in hands of the very beginner it will make less crema that its competitors. In terms of taste I have following observations (it’s all for personal taste and opinion). Delonghi’s deliver espresso with more bitterness, Saeco on the other hand will make coffee with more acidity from the same ground coffee. HB 40715 is somewhere in between with little less aroma. For this round Delonghi coffee maker receives only 3 stars from me. It is very easy to use, but the crema is poor. Saeco gets 5 out 5. HB 40715 got 4 out 5. Very helpful review. I own a Somela Capresso and have converted to a non-pressurized portafilter. With a good grinder (I use a Baratza Virtuoso), careful dose measuring and proper tamping, it produces a very good shot of espresso. Actually, the shots are better than the majority of the ones I get in cafes, except where the barista really knows what she or he is doing. I am now trying to find a second portafilter that I can modify to make a naked/bottomless portafilter for even better results. It is surprising the quality of espresso you can get with home equipment. Thanks for the review. How do you do this modification? The following modification will only work on the Clatronic, Vitek, Hamilton Beach and Somela machines that Dmitriy mentioned above. If you want to just go non-pressurized, first you have to buy a 2-cup non-pressurized portafilter basket like I did on eBay (here is a link https://www.ebay.com/itm/201841439025 ). The baskets that come with the machine have only one small hole in the bottom and will not work in a non-pressurized system. Second, in order for the new filter basket to fit in the original portafilter holder, you have to unscrew the black plastic insert in the bottom of the portafilter and file or cut this insert’s top edges that touch the bottom of the basket carefully until the basket fits flush with the top of the portafilter. Otherwise, it won’t go back properly into the brew head. As I said in my original post, with this set up and careful grinding, dose measuring and tamping, you can make much better single/double shot espressos than with the original set up. I have since also converted a second portafilter to a bottomless/naked set up which I use when I make an individual double shot espresso and don’t want anything interfering with the shot/crema flow. It uses the same non-pressurized basket, and really helps fine tune the tamping technique. If you get it wrong, you get coffee spraying at all kinds of weird angles. When you get it right though, it really looks impressive as it flows out. Really creamy and caramel-like. Wuaw… thank you… (i just recheck this article, and found your answer). I got the “Somela Capresso”, and I’ll bought the non-presurized basket (and make the modifications) in order to try it. I’m considering the Saeca HD 2387/47, the Gaggia Classic, or the Breville Duo-Temp, The Breville infuser is a little out of my comfort zone right now. I’ve been using an old Breville that I got used for $45 for the last three years but the pump is weak (or there is a vacuum leak). Sometimes it works better than others. Maybe I should try to get it tuned up? What are your thoughts? Hi, Alexander. You probably misprint the first model, there is no Saeco 2387, did you meant HD8327? Hi, Alexander. First of all sorry for my late reply. Definetly the Gaggia Classic is the best among these three machines if not considering the price. Especially if you will find the old one. * Old one has the RI8161 index and it has the word “Classic” on top of the logo. While the new one has the logotype with the “Gaggia” on top and the “classic” under it. And it has the new index RI9403. The Saeco HD8327 is a good machine for its price. But it falls into completely different class. Poemia Hd8327 is an entry level machine, which gives the best espresso among cheap machines. However, if in your country price tags for Gaggia Classic and for Poemia are similar, then I don’t see any reason to choose Poemia. For example, in the States the Poemia (as well as Gaggia Gran, which is the same machine under the gaggia name) is overpriced now, probably because Saeco don’t import it officialy now. I don’t personally like Breville, becuase it’s usually overpriced and have strange engineering solutions inside. However, again, if it has the similar price tag to Poemia, then overall it will be better. If, conversely, it costs as much as Gaggia Classic, the Gaggia will be better. Thanks so much for the advice! Happy Holidays! I have a very old, now broken, DeLonghi steam pressure machine. I have been looking for a replacement. I found the DeLonghi pump style with the built-in tamper (useless? ), but the milk steamer is on the left and that won’t work in my kitchen. Can the tamper and steaming wand be reversed by the user? Obviously, I can’t tear into the display model to check it out. Any advice when i really need a right hand wand and want to stay under $150? No, it can’t be replaced. Any modern Delonghi model with a pump has steam wand on the right. Under $150 it will be ECP3420/3630 ($109+ on amazon, my review here), ECO310 ($121+, review) or ECO330 ($126+, very similar to the ECO310, more massive body with more metal). Besides design the main difference between ECP and ECO – different filter baskets. First one gives less crema, but it is easier to use and clean it (see ECO310 review, this is described there). Hi, I’m just wanting to start to make home espresso (to save on buying!) I’ve read that something like the gaggia classic is good to start. However it’s expensive and I can get delonghi icona at the half price. what would you recommend? Icona is a great machine to start with in a low budget, both for espresso and cappuccino. In most pressurized espresso machines the actual pressure at the portafilter is rather low (about 2-3 bar) much less than the 9bar one would want for an unpressurized filter. The pump needs an high pressure (listed at 15 usually) because thats static pressure, once the water starts flowing the pressure drops quite a bit so it needs a good overhead. But it doesnt mean that theres high pressure at the coffee puck, the final pressure to the portafilter is regulated by a small spring valve in the brew head, behind the shower screen. The weaker the spring the higher the final pressure. But there’s a catch, since the system wasn’t engineered for 9bar if the spring is set to that, the pressure of the water heating up in the boiler will be enough to slightly open the valve, dripping water in the portafilter. However if one looks at the great espresso of a lever machine they will find that in those the working pressure is an 8-6bar in average, with a declining profile. What that means is that in modding those cheap espresso machines one can find a good compromise in pressure setting them to a 6bar while delivering the water (static pressure is higher, water flowing means lower pressure because the pumps are what they are, one sets the pressure using a portafilter equipped with a pressure gauge and an orifice that delivers our classic 30ml in 30seconds, all this equipment can be DIYed easily sacrificing one of the filters). Without rising the pressure at the portafilter modding to the unpressurized ones its of limited gain since there wont be much pressure at the puck once the small orifice of the filter is eliminated (you have to compensate with finer grind and a lot of tamping pressure). BTW, once the pressure changes even the filter has to change to obtain the proper flow, in the delonghi for example a good compromise is obtained adapting the screen of the ESE pods to the double basket once the bottom of the basket is cut off (this screen has more flow than the screen of the double basket but the lip of the screen needs to be flared out to seal against the walls of the double basket). Boiler capacity: you want the biggest boiler available for temperature stability. In the cheap machines the boilers are way too small, if you make a double espresso the amount of cold water entering such a tiny boiler is enough to lower the temperature dramatically right when you are mid-shot (that’s why another mod even on better machines is a preheat chamber or copper pipe coiled around the boiler. Beware that because of all the plastic involved and the fact that the pumps in these coffee machines are rated at a max temperature of 20C putting hot water in the tank is not a good thing). On modified machines one can get even good shots, the fact is that ElCheapo machines are very finicky and one has to fiddle and and find a bunch of tricks to get something decent. Good machines instead are very consistent in giving good espresso because they are built better, a lot less random in the results and at the end easier to use. It takes an enormous amount of patience and tweaks to get something out of the cheapies and cant still be served to guests because its always a bit hit and miss, plus the cost of good beans wasted into bad espressos adds up quickly. Its like buying a cheap, unreliable car with a million of complicated quirks and that uses a ton of gas. 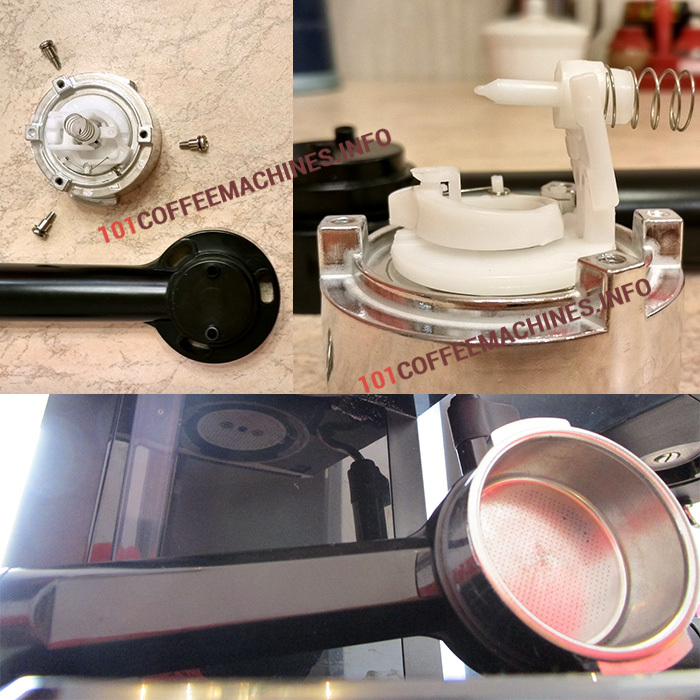 One suggestion is to let the fake crema machines be, mods are possible but its a lot less time consuming to refurbish an older entry model that was created to use the right pressure and has all the right filters etc. If its the crema one wants, be it real or fake, then Im afraid a moka like the Bialetti Brikka will create the fake crema and a better coffee underneath (not espresso but still better than the fakespresso) than pressurized filters espresso machines. Hi Antonio. Thanks for addition. Totally agree with most of the thoughts and that’s what I trying to explain here in my review. But I would rather disagree with your idea about 2-3 bars in the portafilter in pump espresso makers (4-5 bars – yes, sounds realistic). Can’t make an experiment to give some proofs, however, some observations can show it. 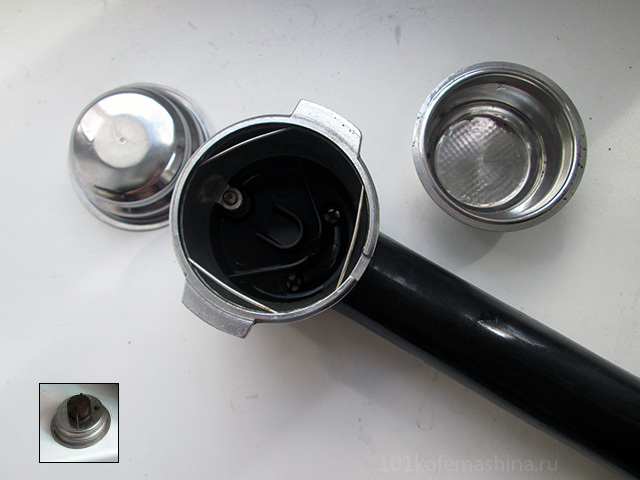 2-3 bars – it’s the pressure in moka pot (the value when the emergency valve opens). 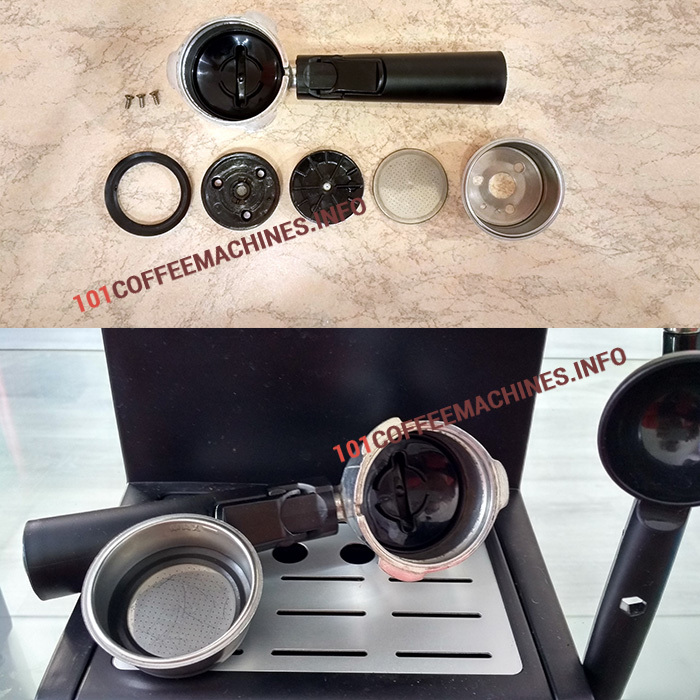 Even the cheapest 15-bar espresso machine will definetly give more pressure inside the filter basket – I noticed many times, that the same coffee puck (grind level, amount of coffee, tamping, and diameter and height being equal) can be pushed by a home pump machine, while moka can’t push water through it. Even Brikka. Hi Dmitriy, mine isnt an idea or an hunch, the pressure was measured with a portafilter pressure gauge calibrated against the pressurized basket. The pressurized filter(or portafilter) is engineered to give you a final flow rate that stays reasonably within the definition of espresso. Once the portafilter pressure gauge replicates exactly the typical brewing flow rate of the pressurized basket (or pressurized portafilter) of the machine you are testing, the measurements you will read are the brewing pressures at the puck during normal use… and they were low. You cant deduce pressures comparing with the moka because a moka is built to work at low pressure, and a properly maintained safety valve will not allow to build up any extra, thats the way it should be. 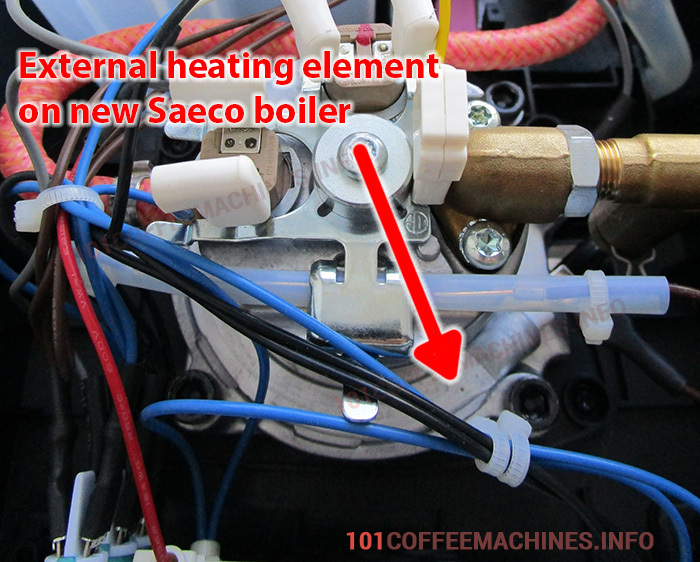 An espresso machine instead is allowed to build up that extra, it has the OPV (or whatever version of an OPV the manufacturer provides) that opens relieving the pressure at the boiler at a much higher limit than in a moka. So, even if the group valve is set to deliver a certain pressure at the designed flow rate (it works like a tap), you can make the pump build up pressure past the group valve in the portafilter reducing the flow rate of the puck ( thats why you can go all the way to the system max pressure using a blind filter or completely chocked filter until the OPV will open returning water to the tank). But at that point you wont be using grind and tamping to fine tune your brewing, you will be using it to completely control the pressure, with the consequence that every difference in the puck will also be responsible of a change of brew pressure making everything very random. Imagine a beginner with no training and reference points trying to find out if the grind or the tamping is off when every tweak of them is also responsible for a different brewing pressure everytime. PS: for someone reading the comments and not getting the group valve discussion looking around the net I found this video, it shows a built-in type of group valve and its effect on pressure (mid-level Gaggias have a serviceable valve removable as unit instead than as parts like the builtin ones and mid-higher end use a 3way valve). Keep in mind that the old model of Gaggia Carezza of that video used non-pressurized baskets/portafilter, the “crema perfetta” disc to place in the portafilter was just for optional use, so it was engineered to work with the standard pressure. Nevertheless the principle of how the group valve works as pressure regulator its the same.